The U.S. Government Accountability Office (GAO) called on the DOT to conduct more research and increase inspection of truck underride guards in a 46-page report issued Monday, April 15. Truck underride crashes occur when a car slides under a large truck, such as a tractor-trailer. When a car slides under the trailer, the passenger compartment can be crushed, severely injuring or killing occupants. GAO said its research suggests that underride crashes happen more often than the DOT’s data suggests. From 2008 through 2017, an average of 219 fatalities from underride crashes were reported annually. But GAO’s research indicates that number is likely underreported due to variables in state and local data collection processes. Congress introduced the Stop Underrides Act in March that would require tractor-trailers to have underride guards on the sides and front. Votes have yet to take place in either the House or Senate. Conduct additional research on side underride guards to better understand the overall effectiveness and cost associated with the guards and, if warranted, develop standards for their implementation. 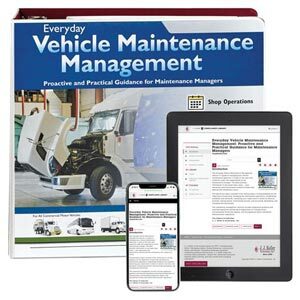 J. J. Keller's Everyday Vehicle Maintenance Management Manual helps maintenance managers improve CSA scores, avoid fines, reduce the risk of costly breakdowns and accidents, and contain costs.